Not every letter writer of the past had the clear handwriting of a clerk. This letter from L.N. Odell of the Odell Balloon Company shows some variations that you may run into. Take a look at "Dear Sir". This is a really useful part of the letter to use to get your bearings, because "Dear Sir" is used in a lot of letters and doesn't often have any spelling surprises. We can see that the lowercase "e" in this word looks like a mirror-image "3", sometimes called a "Greek e". Knowing that the writer of this letter makes his "e"s like this can help us to puzzle out some words that might not be very clear. We can also see that the "a" in "dear" is open at the top. Maybe the writer leaves a lot of his round letters open. Once we plug in "e" where those "Greek e"s are, it might be easier to see that the first word is "very". The second word starts with a clear "l", but the second letter could be a "u" or an "o" with an open top. "lowe*t" is more likely than "luwe*t". What word fits there? That second-to-last letter is just an "s" that's not connected at the bottom, making the second word in this phrase "lowest." How about the last word? If the second-to-last letter is an "e", the third-to-last letter that looks like an "e" probably isn't. What if it's a "c" with a loop at the top? That first letter is a puzzler, though. Take a look at the examples in the Oddly-shaped Letters blog post. The "p" in that post is the same as the first letter in this word. The last word in this phrase is "prices". With our knowledge of the open top "a"s and "o"s, the "Greek e"s, the loopy "c"s, and those pesky "p"s, we can see that this phrase is "ascensions and parachute drops". Which is borne out by checking the red print in the letterhead: this company advertises "four parachute drops" and "night ascensions," so it would make sense that those words are in this letter. 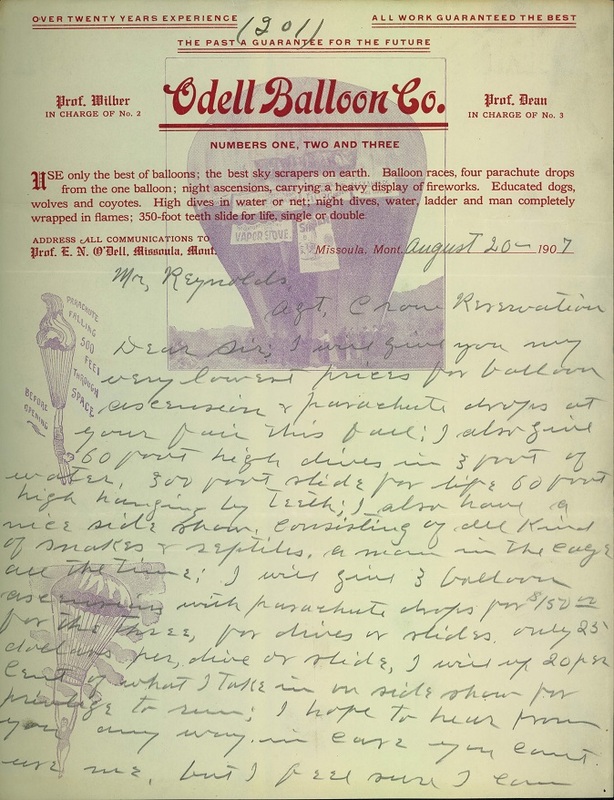 Read the rest of the letter to see what other wonders the Odell Balloon Company offers, and if you want, add the transcription to our catalog! One hurdle to using historic records is how handwriting has changed over time. Here are some tips for reading handwritten documents. 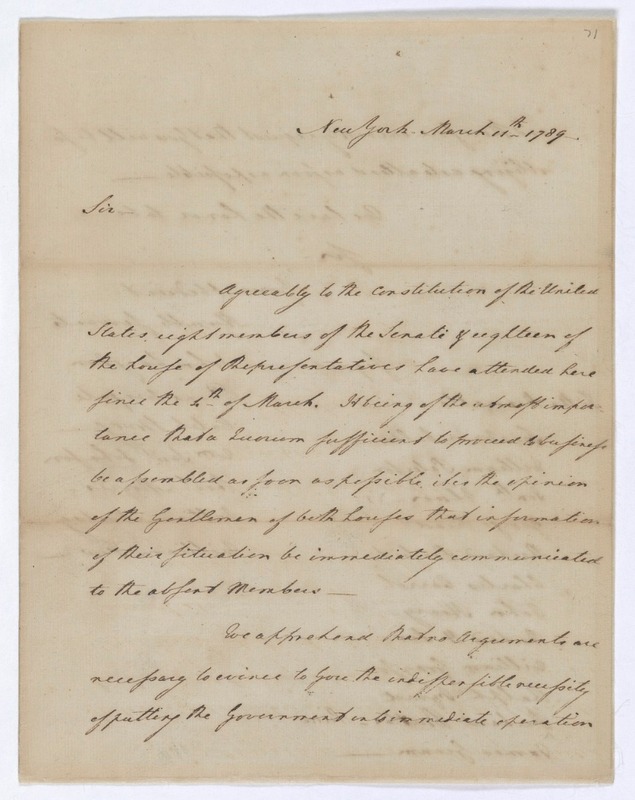 This Letter to Absent Senators from the Senate, dated 1789, has some great examples of letters that look weird to modern eyes, even if you're used to reading cursive. In particular, the lowercase "p" and the lowercase "long s" may give readers some trouble. "Agreeably to the Constitution of the United States, eight members of the Senate & eighteen of the houfe--" Wait, what? This letter that looks like a lowercase "f" is an "s." You'll see these in handwritten and printed documents into the early part of the nineteenth century. Since the two letters look very similar, I tend to use context clues. I ask if the word or phrase makes more sense with an "f" or an "s."
Since our options here are "houfe of Reprefentatives" or "house of Representatives," it's pretty clear which is correct. Another letter that gives me trouble is that lowercase "p." The style here is to have a much taller ascender, or vertical line, than we use on our letter "p"s nowadays. The round part (called the bowl) of the "p" may also be open at the bottom, making it look kind of like an "h."
That second letter is a tall-ascender open-bowl "p." The word is "opinion". Ready to tackle this mess? Using our knowledge of the "long s" and the "p," we can see that this is a common English phrase: "as soon as possible." I hope this is helpful to folks out there who are looking at historic handwriting! Anyone have other tips to share?